Featuring today, beautiful platinum ring by Leon Mege Inc. Its with the combination of Paraiba cabochon, diamond micropave halo in platinum and round Paraibas set in a antiqued silver holding. Diamonds are in the shank and stems. 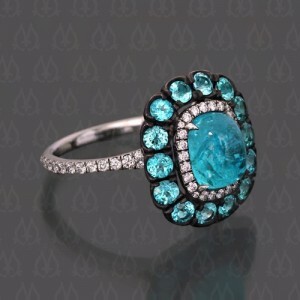 The round Paraiba stones bring out the extraordinary vividness of the Paraiba Tourmaline. You can buy it from their e-Commerce site – micropave.